In imagination, (we) may visit thoughts & feelings, understandings & beliefs, a hundred, hundred, times a day, but at no time do (we) ever, ever, leave home. Suffering is perpetuated by a fixation on returning to thoughts, feelings, notions that have nothing to do with Who-We-Are. 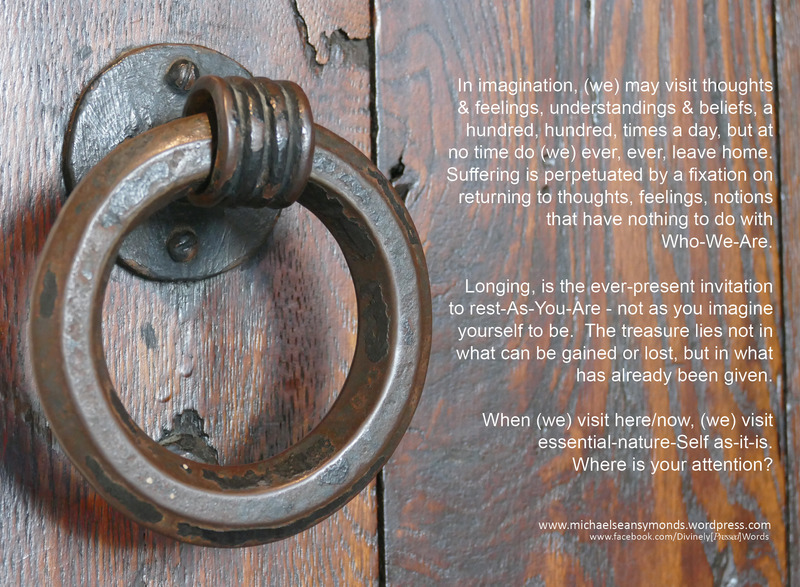 Longing, is the ever-present invitation to rest-As-You-Are – not as you imagine yourself to be. The treasure lies not in what can be gained or lost, but in what has already been given. When (we) visit here/now, (we) visit essential-nature-Self as-it-is. Where is your attention? This entry was posted on Saturday, December 10th, 2016 at 9:44 am and is filed under enlightenment, health, Ideas, life, Musings and opinion. Tagged: after thought, be the change, Depression, happiness, Inspiration, Meditation, Philosophy, Psychology, radical transformation, self improvement, Spirituality, thinking, Yoga, Zen Shredding. You can feed this entry. You can leave a response, or trackback from your own site. « Being Is Infinite Awareness.